Our Hat Line to CELEBRATE DAISY'S 100th BIRTHDAY. 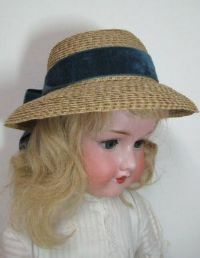 This Daisy hat is a reproduction from the first in the series of Daisy's 1911 Ladies Home Journal Magazine "The Doll That Has Come to Life "
Daisy, Head circumference is approximately 10-11 inches. Requires approximately 20 yards of 1/4 inch hat braid sold separately or as part of a kit. Resized for dolls with a head circumference of 9-10 inches. Requires approximately 15 yards of 1/4 inch hat braid sold separately or as part of a kit. 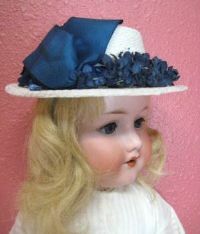 This�Daisy hat is a reproduction from the second�in the�series� of �Daisy's 1911 Ladies Home Journal Magazine�"The Doll That Has Come to Life." Daisy would wear this hat on her honeymoon. Fits Daisy�with a Head circumference is approximately 10-11 inches. Requires approximately 15 yards of 1/4 inch hat braid sold separately or as part of a kit. Inspired by 1911 Ladies Home Jounal Party Clothes for Daisy. 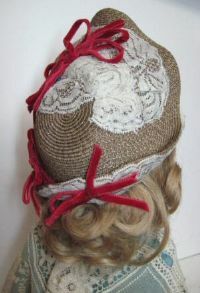 This cloche hat was entitled "Just Too Sweet" in the description from LHJ 1911, with a wide band and bow around the crown and framed around the face with an eyelet lace ruffle. 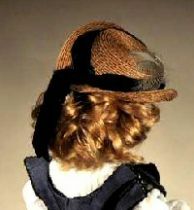 A Deaux Bonjours - Elaborate bonnet with graduated-width brim has upturned brims at both the back and the front of the bonnet. Perfect for your French Fashion Lady. A very pretty tightly woven straw bonnet with rounded top and two side brims (hence, the name, meaning two Hello -Hello). In the first photo, the bonnet brim is covered inside and outside with classic red cashmere wool. 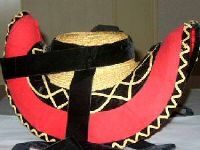 Black velvet bands and streamers, along with woven straw in soutache embroidery ornate the bonnet outside. Specific instructions are being developed. 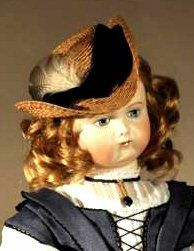 Form Availble now - For a Lady doll with a head circumference 6"-7". Requires approximately 8 yards of 1/4 inch hat braid sold separately or as part of a Kit. Please check the form checkbox to order the form . Tell a friend about our new hat forms for Daisy! This Hat was designed with Daisy in mind and inspired by Lettie Lane's paper dolls. 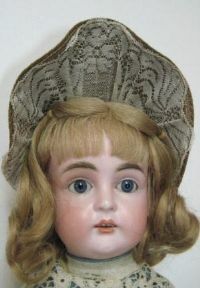 It has a wide scalloped front brim that frames your doll's face and tapers into a rounded crown. Decorated with lace and velvet ribbons. Fits Daisy, Head circumference is approximately 10-11 inches. Requires approximately 20 yards of 1/4 inch hat braid sold separately or as part of a kit. 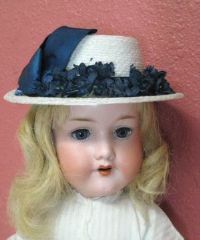 This sassy hat is shown on a 14" Bebe Huret and designed by our Founder Peggy N Brown. 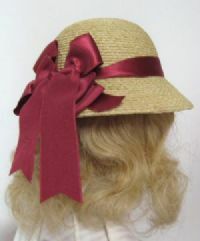 It requires approximately 12 yds of 1/4" hat braid sold separately or as part of a kit. It fits a doll with a head circumference of 8.25" to 8.5", measured without wig. 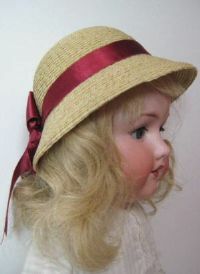 It is also suitable for larger Fashion Dolls 16-18" tall. Now available, 070-A, for your 16" Fashion Doll with a head circumference of 6 3/8" - 7". 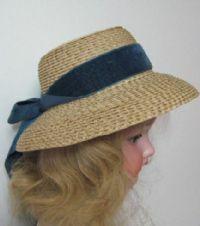 We tried it on one of our Little Darling dolls and it is a very jaunty look for her too. It requires approximately 10 yds of 1/4" hat braid sold separately or as part of a kit.